The Ohio Association of Community Colleges (OACC), the state office for Ohio’s 23 community colleges, received a Kresge Grant to begin a Student Success Center. Success Centers, now in four states, were developed to provide statewide cross collaboration and support. Ruth Silon, English faculty at Cuyahoga Community College in Cleveland, Ohio, was hired to be the Executive Director. The main goals of The Ohio Success Center’s work are to help the colleges as they reform developmental education and to scale up evidence based practices. While at Cuyahoga, Ruth was the Project Director for the Developmental Education Initiative, and while attending various conferences, she heard Peter Adam’s ALP presentation. 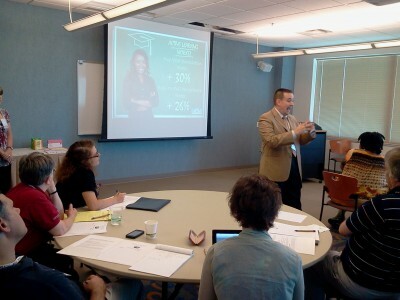 With DEI funds, Peter Adams came to Cuyahoga to meet with faculty and administrators, and ALP was started at the college. Now in a statewide position and responsible for scaling up evidence based practices, the opportunity arose for Ruth to bring ALP to Ohio. Last July, 3 English faculty and 1 administrator from the 23 community colleges attended The Student Success Center’s two-day retreat entitled “Accelerate, Cooperate and Contextualize.” The almost 100 participants were divided into three groups and cycled through three workshops on each of the topics. Peter conducted three two hour workshops, giving his presentation and holding conversations with faculty and administrators from across the state. Faculty from the various colleges had the opportunity to discuss their acceleration efforts, in both college composition and developmental education. Michelle Zollars, English faculty at Patrick Henry Community College, led the Cooperative Learning workshop. Michelle was a perfect fit as she uses Cooperative Learning in her ALP classes. She, like Peter, conducted three workshops. The Contextualization Workshop was presented by three Ohio English faculty from different colleges. The emphasis was on the material and assignments used when contextualizing the composition class for specific majors. The purpose of the retreat was to encourage faculty to embrace the three areas as one model for teaching College Composition. ALP focused on how and why to accelerate students in to college composition; Contextualization concentrated on why it is essential to get students reading and writing about their intended career in a composition course, and Cooperative Learning provided best practices for learning. 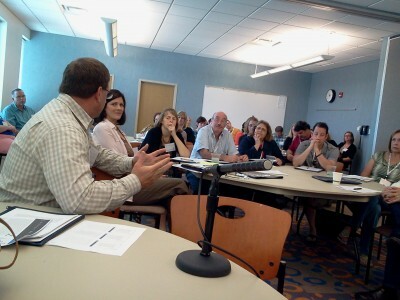 Since the retreat, a statewide core team to promote the model and these practices was formed. In September the team held a conference call and discussed progress and concerns that have emerged since July. Rio Grande CC is going to be piloting ALP in the spring. Washington State CC is creating a dual enrollment program for students in the lowest level of Developmental English; they will take ABLE classes at the same time. Sinclair CC is going to hold a summit with counselors and advisors to help them really understand and place students in ALP classes, to help the college move from pilot to scale. The team will meet again during the OACC Student Success Symposium in December. This entry was posted in Featured ALP Schools by Admin. Bookmark the permalink.